REI has been our partner and sponsor for over 20 years, providing funding for major projects including; trail renovations, interpretive trail signs, wayfaring signs and the Children's Nature Trail. REI has been a consistent sponsor and partner for annual events including National Trails Day and National Public Trails Day. HagerSmith Design, PA worked with preserve staff and the Friends of Hemlock Bluffs providing professional design services pro bono to design the Children's Nature Trail. Design materials, including maps and drawings were used to secure grants and donations to fund the trail project. 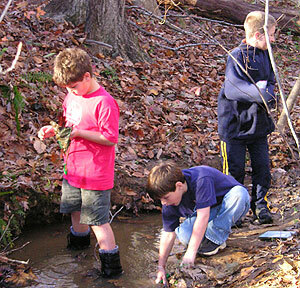 The design work provided by HagerSmith was pivotal in the development of the Children's Nature Trail. 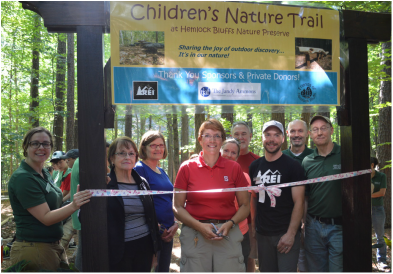 Activate Good has linked volunteers and professionals to Hemlock Bluffs and the Friends of Hemlock Bluffs for over 10 years. Activate Good finds corporate volunteers that wish to do good in the community and work as a team to provide labor and "know how" . These groups have implemented projects that would otherwise be insurmountable for preserve staff and the Friends Board to accomplish. Activate Good also spearheads a Pro Heroes program, connecting local content experts with non-profit organizations who need advice or services. 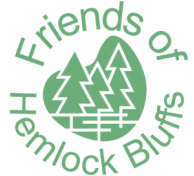 The Friends of Hemlock Bluffs have greatly benefitted from this program and the organization has flourished. The Children's Nature Trails Dedication. With all our Sponsors present; Jandy Ammons, REI and our Artist Suzanne Portanova. Our Children's Nature Trail Designers from HagerSmith, Jimmy Thiem and Jamie Loyack.